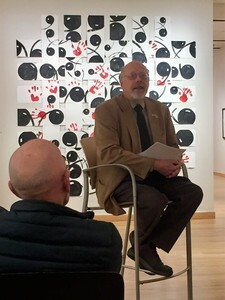 With a backdrop of artwork consisting of woven, graphic cannonballs by contemporary artist Joe Zucker, historian John R. Wright dismantled our collective misconceptions of what it meant to be a pirate in the early 1700's during his lecture at the Housatonic Museum of Art last Thursday. Peg legs, eye patches, parrots, buried treasure and pieces of eight are all parts of the classic representation of pirates that we know today, thanks in large part to Treasure Island. “The movies portray frenetic images of pirates when in truth they were well-organized. To be at sea you have to work as a team to stay afloat,” explained Wright. Did you know that pirates governed themselves according to a democratic hierarchy? Crews voted for their officers and captain, and they could be voted out of position at any time. Articles or lists of laws while onboard, spelled out rights of sailors, their degree of compensation and punishable offenses. Offenses drew floggings with a cat of nine tails, keelhauling (dragging them through the water under the keel of a ship), marooning on a desert island with a bottle of rum and a pistol with one shot, or death. However, states Wright, pirates did not walk the plank; that misnomer originated from illustrations, possibly by N.C. Wyeth and Norman Rockwell. Were all pirates men? “There are at least 50 cases of women pirates, but usually they were disguised as men,” said Wright. Wright pointed to two of the most well-known women pirates, Anne Bonny and Mary Read, who worked together, and when captured, claimed pregnancy to delay their death. Did pirates sail large three-mast vessels? Most did not. “Most pirates sailed in small, fast vessels to stay ahead of those chasing them,” said Wright. “Few sailed with ships loaded with cannons, but pirates with big sailing ships were armed to the teeth, such as Blackbeard and Captain Kidd. “The majority of pirates were not anxious to fight or kill people,” Wright stated. Scaring you out of your treasure was better, and their first weapon of choice was unfurling their flag, typically depicting a skull and crossbones in black in white. The effect was intimidating. “Most victims surrendered to avoid fights,” said Wright. The pirates would then strip the cargo holds of molasses, fabrics and timber, which they would later sell at a deep discount from their competitors. Missing teeth, hooks for hands, eye patches and missing legs weren’t pirate hallmarks, rather they were common at the time. Early in the 18th century, medicine was primitive and amputation was a common solution to healing an injury. The Scrolls exhibition by Joe Zucker remains on view in the Housatonic Museum of Art through December 15. The Housatonic Museum of Art (HMA) is home to one of the premier college art collections in the United States. Its collection offers students and the community alike the opportunity to view works that span the history of art from the ancient to the contemporary. Unique to the Housatonic Community College campus, this permanent collection is on continuous display throughout the 300,000 square foot facility, offering a rare opportunity for both art enthusiasts and casual observers to view and interact with the art on a daily basis. Visit www.HousatonicMuseum.org to learn more.